It is a fact that every little bit helps! One of the biggest landfill and waste pollution problems is plastic water bottles! They are clogging up landfills, killing water life, and ruining our beautiful land and oceans. There are many solutions to reducing plastic waste. We can choose to recycle them, but a better choice would be to filter our own tap water, and stop purchasing them all together. A good quality water filter is the perfect solution to the glut of plastic water bottle waste. Simply hook them up to your faucet or water supply, and your water is filtered and safe to drink. It is important to know what is in your water by having it tested by a qualified lab. Once you know what contaminants are in your water, purchase an NSF certified water filter to insure that the contaminants found are what the filter removes. 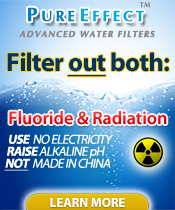 (NSF insures that the filter you are buying is certified to reduce the contaminants that may be found in your water). Also make sure to check with the manufacturer of that filter to see if their product removes the contaminants you want out. Another great option for people on the go, is reusable water bottles with a filter built right in. Many water filter companies are developing water filter bottles to help stop plastic waste. These reusable water filter bottles are designed to filter any water, anywhere. • The Brita Bottle has been tested and certified by NSF International against NSF/ANSI Standard 42 for the reduction of chlorine (taste and odor) and particulate reduction (class VI). • Filter life, 2 months or 40 gallons/150 litres. It is a fact. Using a water filter instead of purchasing bottled water is helping to reduce plastic bottle waste. The more choices we can give consumers, the better. Filtering your own tap water with a high quality filter saves the environment, your budget, and could possibly improve your health! It is a win, win, win, for all. Good health to you! Safe drinking water is a life essential. Without pure, safe drinking water, the body and all of its intricate systems will shut down. We tend to take for granted that safe water will always be available. What are the proper measures to be taken when purifying unsafe drinking water? There may come a time that knowing how to purify water can mean life or death. The U.S. Environmental Protection Agency estimates more than ninety percent of the world’s water is contaminated by natural and unnatural causes. There are many ways that water can become contaminated and unsafe to consume. Biological and toxic are the two main forms of contamination. Biological contamination is the presence of microorganisms, bacteria, and viruses. These can occur naturally in any supply and can potentially make consumption dangerous. Chemicals that enter the supply through pesticides, and pollution cause toxic contamination. It is easy to properly purify a biologically contaminated water supply, boiling rapidly for one minute will kill most harmful bacteria and other organisms. Let the water come to a fast boil for one minute or longer. Let it cool naturally, to insure safe drinking. Chemically contaminated water is more difficult to purify for safe drinking. There are two basic ways to clean a chemically contaminated supply. Products can be purchased to keep on hand to purify safely. The best chemicals to clean chemical contamination are iodine and chlorine. Purification methods for chemically contaminated water may not be as effective if it does not reach a certain temperature. To properly clean chemical contamination first pour it through some type of filter that will remove any large particles. If the supply is cloudy, this will mean extreme contamination and is harder to clean. If possible, warm the water to at least sixty degrees. Add the chlorine tablet to it and stir to completely dissolve. Leave the chemical mixture for at least thirty minutes. Once treated, the taste can be altered by adding salt or a flavored dry drink mix. Iodine is more effective than chlorine to treat a water supply. It is also important to note that some people may not tolerate iodine. They may have an allergic reaction to it. Use this form only if you are sure you will have no adverse reaction. To use iodine to treat chemical contamination, bring the temperature up to over sixty-eight degrees. Iodine treatment comes in a few forms. In liquid form, the general rule is five drops per quart. The crystal form comes in a container to be mixed with water. As specific amounts may vary, consult package directions for the correct amount and procedure. The tablet form of iodine is also most effective by consulting the package directions. If the supply is contaminated by particles that can easily be seen. Filtering may purify to drinking quality. Filtration is only recommended if the contaminates are known. If unsure what chemicals are contaminating the supply, use a combination of chemical and filter purification to bring it to drinkability. Understanding what is contaminating the water is the only way to be sure to purify it correctly. Life threatening illness and death can result when ingesting contaminated water. Be sure to use the right procedure. The importance of a clean water supply is evident everywhere. People, plants and animals all need it to survive. Water is essential to all living creatures. When the water supply is not clean, it is not healthy. When contaminated it cannot sustain life. Once it is contaminated, it must be cleaned to be healthy once again. People and animals need clean water. A human body is over 70% water. Every mammal body function and part needs water to survive and work effectively. Contaminated water can harm every system in the body. Not enough clean water can also do irreversible damage to the brain or other vital organs. Humans use it in many ways. Cooking, bathing, washing and drinking. Taking a bath or shower in dirt, would just not get a person clean. We do not cook with dirt, nor do we drink water that we can see is dirty. Animals have the same need for clean streams, lakes, and rivers. Mammals, birds, fish and reptiles depend on a clean supply for their survival. Many animals have perished due to lack of clean, healthy supply. Contamination happens in a variety of ways. Man made disasters like a large oil spill. Pollution from man made manufacturing releases pollution into the air, which will contaminate the supply. Throwing trash randomly into a stream or lake is another way to contaminate the supply. Mother Nature also contributes to an unhealthy supply. Drought, earthquakes, tsunami, tidal waves, and any number of other natural disasters can contaminate the supply. Nature also has its own way of cleaning up the mess she delivers, but it can take hundreds of years to once again become a healthy resource Humans are careless and do not think that there will ever be a time when all water is unsafe to use. We get used to having clean water readily available. When there comes a time that clean, healthy water is unavailable, what will happen to the human race? The effect of unhealthy water is evident in countries that have suffered from earthquakes and other natural and manmade disasters. Cholera, dysentery, and dehydration is prevalent in any place on earth that has had a major disaster. Water is used by every bodily function. Without clean healthy water, the body cannot function. Clean drinking water should be abundant. Studies have shown biological or chemicals in some form contaminate most of the drinking water supply. As a result, we are studying ways to clean drinking water for consumption. Some water is cleaned by a filtration system. On a large scale, city water is cleaned at a central location and travels through a pipe system to households, seemingly clean and healthy. Some rural homes have a private well system that pumps water from the land the home is on into the home. Farm and lawn care chemicals can contaminate a private water supply and not be detected by the homeowner until residents become ill. We have a personal stake in insuring clean healthy water. Many home and business owners filter their own water to be sure it is clean and healthy. Filtering water before consuming is one way to be sure to have a clean water supply. Tap or bottled; what water is better? We all know that it is essential to life. Healthy water comes in many forms. It can be purchased bottled, or straight from the tap. Tap water can be filtered, or not. What does the water you choose to drink do to the environment? Get the facts before you choose. If the environment is not healthy, how can it be healthy? Bottled water is convenient, easy to grab when one is on the go and want to drink healthy. Drinking plenty of it keeps the body healthy and in shape. As bottled is more convenient, it encourages healthy drinking habits. There are studies that show some bottled water has as many or more contaminates than that of tap water. Bottled water is a booming business. Many companies market and sell water in bottles. The price for a single bottle averages around $1.00 per 12 to 16 oz bottle. This makes it, when purchased in a single serve plastic bottle, more expensive than a gallon milk, and even a gallon of gas! If the cost alone is not enough to convince that bottled may not be the best choice, consider the environmental effects of getting it into those plastic bottles. The manufacturing of bottles to put it in contributes to pollution. The plastic bottles that do not get recycled pollute the environment and the methods used to recycle plastic. It takes 1,000 years for plastic water bottles to bio degrade. There are many other adverse effects that bottled water has on the environment. Where does bottled water come from? Does it come from that babbling brook that is shown on the advertising? Surprisingly, most so called fresh form the brook water is nothing but filtered tap water put in fancy packaging to look like it comes from the cleanest places on earth. Tap water is an alternative to bottled water. Tap is better than bottled for several reasons. It is readily available and easy to transport. Just turn on the tap and fill up a glass. Tap water is just as healthy as or even healthier than bottled. In most cases, the origin of tap is easy to trace. It either comes from a private well, or a city supply. If there are contaminates in the tap water, they can be easily removed with a water filter. Water filters come in many forms for filtering an entire house or business, filter pitchers to filter tap water for drinking. When tap water is chosen over bottled water, there are less adverse effects on the environment. There are no bottles to produce or dispose of. The water comes from home, not a factory. When choosing tap or bottled, what water is better is up to the consumer. Consumers should educate themselves on the value of each and their ultimate effect on the environment. Tap water is better environmentally than bottled water. Bottled water is more convenient than tap water. Each has its good points and bad. When it comes to the essential water for sustaining life, we should choose wisely. Choosing the right house water filter is not only an investment in a home, but also a healthy family. Whole house water filters are costly, but they add value to a home and provide the family with healthy water. Learning how house water filters work will make the choice easier. Size of Household To aid in the choice, estimate how much water is used by the household. An average family of four will use about six gallons per minute. A larger family or a house with multiple bathrooms will use more water. A 9 or 10 Gallon Per Minute (GPM) house filter system will provide an average family with enough water. A larger family should get a 12 or 14 GPM system. Carbon House Water Filters A carbon filtration system has the ability to remove chlorine, lead, cysts, THMs, VOCs, lindane, alachlor, atrazine, benzine, TCE, and MTBE. There are different types of carbon filters available for a house water filter. A carbon block is made from pressed, honeycomb shaped bricks. The bricks are very effective in removing toxins from water. An activated silver impregnated charcoal block will remove more water contaminates. Micron rating is used to determine the density of the filter. The smaller the micron rating the more contaminants will be filtered from the water. Reverse osmosis The reverse osmosis process draws water through a filter with more density than a carbon filter. This ultra thin filter can purify salt water into drinkable water. This process is much slower than the carbon filter system, but will remove more contaminants from household water. Additional Costs A whole house water filter will need to be installed by a licensed plumber. The carbon filtration system requires replacing the filter every six to nine months. The reverse osmosis system requires occasional back washing to clean out the filtration system rather than replacing it. Some reverse osmosis systems have an automatic backwash, but most will need to be backwashed manually. Backwashing takes a lot of water. The cost added to your utility bill may or may not be as much as a replacement filter. Other Points To Compare Reverse osmosis is so efficient, it removes beneficial elements from the water supply. It is also not very water conservative, as it wastes three gallons of water for one gallon that is made usable. The reverse osmosis systems let some synthetic toxins like pesticides and pharmaceuticals into the water supply. A carbon systems uses an activated carbon filter with a process that requires several stages and an ion exchange to remove 99.9% of all contaminants, including the synthetic toxins, while leaving in those essential trace minerals. Drinking water is important for general health. Contaminants in water cannot be seen, but they are there. Toxic bacteria, heavy metals, and chemicals pollute most natural water sources. Bottled water may have some unhealthy contaminants removed, but the plastic from the bottles further contaminate the water with the additives that occur in the plastic. Filtering your home tap water is a good solution to rid drinking water of unhealthy contaminants. Install an under sink water filter according to the manufactures directions. If the sink has a sprayer, another hole will need to be drilled to accept the filtered water dispenser. This dispenser looks very similar to a faucet, but will dispense filtered, healthy water. The hole will need to be drilled in the sink or on the counter top. Drill the hole and place the dispenser in the hole. Locate the cold water line and turn it off. Turn the faucet on to remove excess water from the line. Locate the saddle valve. Follow the directions, and drill a small hole into the cold water supply line. With the new saddle valve, turn the handle to show the puncturing part of the valve. Place the valve over the hole that was just drilled. Place the plate on the back of the water line, behind the new valve, place the valve over the drilled hole, and tighten the pieces together. Turn the handle until the puncturing part pierces into the hole in the water line. Place the unit under the sink in between the dispenser and the cold water line. The instructions will have specific measurements. Attach the unit to the back of the cabinet using the screws provided with the water filter. Measure and cut the provided plastic tubing to fit the area between the unit and the saddle valve. The tube should be long enough to allow some slack, but not cause a kink in the line. Place one of the supplied compression fittings on the end of tubing and attach to the saddle valve. Tighten with a wrench. Place another compression fitting on the other end of the tubing and thread into the inlet of the unit. Tighten the fitting. Measure another piece of tubing to fit from the unit to the dispenser. Leave some slack, but not enough to kink. Install a compression fitting to one end and attach to the unit. Install another compression fitting to the other end and attach this to the dispenser. Turn on the water and let it run for a few minutes to fill the tanks with water. This will remove any air pockets and excess carbon dust. Turn on the dispenser and allow this to run for about 20 seconds to insure filtration. Your under the sink water filter is ready to dispense healthy clean water. Drinking water is important for general health. There are contaminants in water that cannot be seen, but they are there. Toxic bacteria, heavy metals, and chemicals pollute most natural water sources. These contaminants are ingested by drinking tap water and most bottled water. Filtering your home water supply is a good solution to rid household water of unhealthy contaminants. What is really in your water? When choosing a water filter for the home, be sure it removes the contaminates that are specific to the water supply. If the water is supplied by the city, the Health Department will have a list of known contaminants. If the water is supplied by a private well, testing will need to be performed to determine what contaminants are in the water. Water testing supplies can be purchased at a local hardware store or from the local Health Department. Use this information to assist in choosing the best cost effective water filter for your home and location. The Pitcher Filter The pitcher filter uses a filter assembly that is located inside a pitcher. Water is poured into the filter area and filters through to the pitcher. This type of water filter removes only a few contaminants. The average annual cost of filtering a years supply of water is $274.00 per year, or $0.25 for a gallon. Drinking Water System The drinking water system is an under the cabinet model. It filters water as it comes into the kitchen tap. This model removes chlorine, lead, cysts, THMs, VOCs, lindane, alachlor, atrazine, benzine, TCE, and MTBE. This model has an average annual cost of $210.00 per year or, $0.10 per gallon. The Counter Top Model The counter top model removes the same contaminants as the drink water system, plus many more. The counter top model attaches to the existing faucet and filters the water on demand with the turn of a switch. The counter top model has an average annual cost of $57.00 or $0.08 per gallon. Whole House Filter Systems Whole House Filter Systems attach to filter the water supply for the entire house. These are used mostly to remove chlorine, taste and odor. The cost of a whole house filter range from $500.00 to $5,000.00. Filters on both models should be replaced annually. The cost for a replacement filter ranges from $104.00, to $2,950.00 for a year of filtered water. Installing a water line and drain pipe for an under the counter dishwasher is the same for a new dishwasher as it is for an old one. Once the location is chosen and the electrical works are connected, before the electricity is turned back on, install the water line and drain pipe for the dishwasher. Proper placement of water tubes and drain pipes will insure the dishwasher works correctly. Be sure to have everything you need before starting to install the water line. The items needed are, a shutoff valve, the water line, a tape measure, a hand saw, a piece of copper tubing, a drain tube, a T-fitting, an adjustable wrench, and 4 compression fittings. Before starting any work on the water line, be sure to shut off the water and empty the hot water line. Put a container under the hot water line and cut the line to install the T-fitting. Place a compression fitting on each end. Tighten the fittings by hand, and then just a quarter turn with the adjustable wrench. Attach the shutoff valve to the T-fitting. Secure the water line from the dishwasher to the shutoff valve. Keep the container under the hot-water supply line. Turn the water back on. Look for leaks in all connections. Carefully tighten the connections a quarter turn at a time, if there is a leak. Once there are no leaks, time to move on to the drain hose. Install the drain hose by measuring and cutting the drain tube to fit from the dishwasher to the drain. If attaching the drain hose through a garbage disposal, there will be space in the disposal to install a dishwasher drain pipe. If there is not a disposal, a waste T-fitting will need to be installed to attach to the drain. Be sure to secure all connections before testing. Turn on the water and test again for leaks. If leaks are present, tighten the connections a little more, being careful not to over tighten. One quarter turn at a time, until the leak is stopped. Copper is a soft metal and will bend or break easily. Once all connections are not leaking, finish installation of the dishwasher and run a test cycle. Check once again for any leaks. Once no leaks are found, installation is successful and finished. Place the dishwasher securely in its place. If you have one, always refer to the installation manual for manufacturer specific installation. The ice and water dispenser on a refrigerator door is a very nice convenience. Over time, the ice and water outlets and the reservoir will get dirty and full of germs. The water reservoir on a refrigerator should be cleaned regularly to keep it clean and germ free. Cleaning the ice and water outlets should also be cleaned to insure it is clean and safe to dispense form. If the water reservoir is allowed stay wet and dirty, it can look and smell terrible. A little skill is needed to clean the outlets and the reservoir. Only safe cleaners should be used to clean the ice and water dispensing parts. Gather the necessary supplies and get cleaning. White vinegar, a 1 cup measuring cup, a screwdriver, some gray tape and an old toothbrush should get the job done. The very first thing to do is unplug the refrigerator and turn the water supply to the refrigerator to the off position. Unscrew the screw that is holding the copper water supply tube in place. Slide the copper tube out of position. Holding the tube upright, pour about 3 cups of vinegar into the tube. Hold the tube over the reservoir to catch any overflow. Leave the vinegar sit for 5 minutes in the tube and the reservoir. Using grey tape, attach the copper tube to the back of the refrigerator to keep the vinegar draining down towards into reservoir. Empty the ice dispenser by depressing the ice dispenser lever to expel all of the ice. Let about half of the vinegar flow through to flush out any dirt. Next, depress the water lever on the water dispenser. This will allow the vinegar to run through the water supply pipes and tubes getting a complete cleaning. Keep the button pressed until all the vinegar has ran through into the reservoir. If the reservoir is small, empty it as it gets full. Dip a toothbrush into the vinegar in the reservoir. Scrub the spouts that the ice and water flows through with the old toothbrush. Continue scrubbing with the toothbrush. Be sure to clean the entire ice and water dispensing center with vinegar. Pay close attention to the corners of the reservoir. Remove the reservoir tub. Rinse well in the sink with warm water. Replace. Place the copper tubing back in its space. If the refrigerator was moved, return it to position. Turn the water supply back on. Run fresh water through the ice and water spouts for a few minutes to rinse all vinegar out. Over 50% of us show some concern about home drinking water quality. Those that are worried about the water quality in their home often turn to bottled. Is bottled really the best idea? Where does the water in that bottle come from? Bottled water may not be any safer than what comes out of your own tap. A study conducted in 1999 by the National Resources Defense Council titled “Bottled Water. Pure Drink or Pure Hype” discovered that advertising gets people to buy bottled water. The advertising makes a consumer think the bottled water is pure. Bottled water has just as many contaminants as your own home, tap water. Maybe more. In fact, it very well could be filtered tap water. One third of the bottles tested in the 1999 study was contaminated with arsenic, synthetic chemicals, and even bacteria. Better? I think not! So, where can you get water that is better than bottled water? Why not in your own home? Home water filtration has come a long way. Today there are many choices for purification of home water supply. The bottles even add to the contaminates. They are made with petroleum products that seep into the contents of the bottle. Not only that, but it is cheaper than bottled, home filtered water has an average cost of 10 cents per gallon. Compare that to at least a dollar for a 16oz bottle. Home filtered water is a “green” choice. If we aren’t buying all those bottles of water, there would not be as many bottles collecting in land fills. Bottled water is a scam! Filtered water is the way to go! There are many good home filters available. Research to find the one that will filter what you do not want in your supply. Can Alkalaine Water Help My Pets Health? The Energy Information Administration reports the shift will probably happen by 2030, and it credits domestic natural gas production. The agency says it is watching variables such as new technology. Saturday's large quake immediately raised suspicions that it was linked to injection wells that oil and gas companies use as part of fracking and other operations. A U.S. judge in Wyoming said the Bureau of Land Management can't regulate hydraulic fracturing — because more than a decade ago, Congress specifically excluded fracking from federal oversight. Copyright © http://indianawaterfilters.org/essentialwaterblog 2012 - 2019 all rights reserved.